No matter where you’re headed, this black pod clutch will be your best friend! With a textured saffiano finish and gold tone lining hardware, it creates a beautiful contrast in colour. A piece that will fiercen up your look - pair with a black lace midi dress to channel a sophisticated chic look or a gold sequin gown for a red carpet ready look. Finished with an Olga Berg clasp and an optional shoulder chain, this is a must have to rent for all occasions! Don’t be afraid to pair this black clutch with a bright coloured dress! 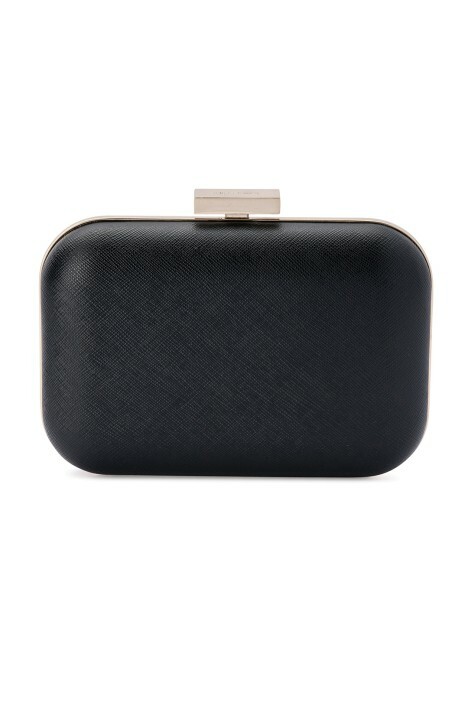 Hire a floor sweeping gown that will surely amplify the simplicity of this clutch. Read How to Dress like Olivia Palermo for more style tips and inspiration.